The Servicemen’s Readjustment Act of 1944—commonly known as the GI Bill of Rights—nearly stalled in Congress as members of the House and Senate debated provisions of the controversial bill. Some shunned the idea of paying unemployed Veterans $20 a week because they thought it diminished their incentive to look for work. Others questioned the concept of sending battle-hardened Veterans to colleges and universities, a privilege then reserved for the rich. Despite their differences, all agreed something must be done to help Veterans assimilate into civilian life. Much of the urgency stemmed from a desire to avoid the missteps following World War I, when discharged Veterans got little more than a $60 allowance and a train ticket home. During the Great Depression, some Veterans found it difficult to make a living. Congress tried to intervene by passing the World War Adjusted Act of 1924, commonly known as the Bonus Act. The law provided a bonus based on the number of days served. But there was a catch: most Veterans wouldn’t see a dime for 20 years. A group of Veterans marched on Washington, D.C., in the summer of 1932 to demand full payment of their bonuses. When they didn’t get it, most went home. But some decided to stick around until they got paid. They were later kicked out of town following a bitter standoff with U.S. troops. The incident marked one of the greatest periods of unrest our nation’s capital had ever known. The return of millions of Veterans from World War II gave Congress a chance at redemption. But the GI Bill had far greater implications. It was seen as a genuine attempt to thwart a looming social and economic crisis. Some saw inaction as an invitation to another depression. Harry W. Colmery, a former national commander of the American Legion and former Republican National Chairman, is credited with drawing up the first draft of the GI Bill. It was introduced in the House on Jan. 10, 1944, and in the Senate the following day. Both chambers approved their own versions of the bill. But the struggle was just heating up. The bill almost died when Senate and House members came together to debate their versions. Both groups agreed on the education and home loan benefits, but were deadlocked on the unemployment provision. Ultimately, Rep. John Gibson of Georgia was rushed in to cast the tie-breaking vote. The Senate approved the final form of the bill on June 12, and the House followed on June 13. President Franklin D. Roosevelt signed it into law on June 22, 1944. The Veterans Administration (VA) was responsible for carrying out the law’s key provisions: education and training, loan guaranty for homes, farms or businesses, and unemployment pay. Before the war, college and homeownership were, for the most part, unreachable dreams for the average American. Thanks to the GI Bill, millions who would have flooded the job market instead opted for education. In the peak year of 1947, Veterans accounted for 49 percent of college admissions. By the time the original GI Bill ended on July 25, 1956, 7.8 million of 16 million World War II Veterans had participated in an education or training program. Millions also took advantage of the GI Bill’s home loan guaranty. From 1944 to 1952, VA backed nearly 2.4 million home loans for World War II Veterans. While Veterans embraced the education and home loan benefits, few collected on one of the bill’s most controversial provisions—the unemployment pay. Less than 20 percent of funds set aside for this were used. 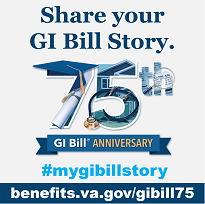 In 1984, former Mississippi Congressman Gillespie V. "Sonny" Montgomery revamped the GI Bill, which has been known as the "Montgomery GI Bill" ever since, assuring that the legacy of the original GI Bill lives on, as VA home loan guaranty and education programs continue to work for our newest generation of combat Veterans. In 2008, the GI Bill was updated once again. The new law gives Veterans with active duty service on, or after, Sept. 11 2001, enhanced educational benefits that cover more educational expenses, provide a living allowance, money for books and the ability to transfer unused educational benefits to spouses or children. President Franklin D. Roosevelt signs the G.I. Bill into law. It gives servicemen and women the opportunity of resuming their education or technical training after discharge, or of taking a refresher or retrainer course, not only without tuition charge up to $500 per school year, but with the right to receive a monthly living allowance while pursuing their studies. It makes provision for the guarantee by the Federal Government of not to exceed 50 percent of certain loans made to veterans for the purchase or construction of homes, farms, and business properties. It provides for reasonable unemployment allowances payable each week up to a maximum period of one year, to those veterans who are unable to find a job. It establishes improved machinery for effective job counseling for veterans and for finding jobs for returning soldiers and sailors. It authorizes the construction of all necessary additional hospital facilities. It strengthens the authority of the Veterans Administration to enable it to discharge its existing and added responsibilities with promptness and efficiency. With the signing of this bill a well-rounded program of special veterans’ benefits is nearly completed. It gives emphatic notice to the men and women in our armed forces that the American people do not intend to let them down.